CRAZY DISCOUNT! Was: $199.95 Now: $84.95! 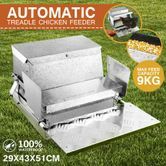 Share the burden of feeding poultry chores with this 9kg Automatic Chicken Feeder Galvanized Poultry Chook Treadle Self Opening Coop. With an ample 9kg capacity of chicken feed, your chooks, ducks and geese will never be hungry even you aren't at home for a period of time. 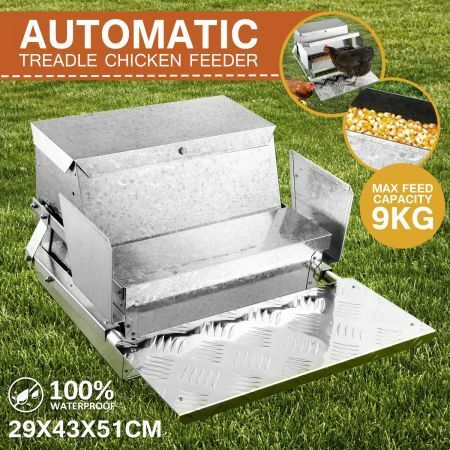 Imagine that, the lid of the chook feeder is designed to prevent poultry feed from stealing by wild birds, rats and other pests. However, the lid can be lifted easily by the weight of your chicken when they stand on the treadle. Featuring high quality and durable galvanized steel construction, this chicken feeder is waterproof and rustproof. Settle this chicken feeding trough confidently in your own backyard or farm to provide a pleasant mealtime for your poultry. SAVE MONEY: Cutting down on the poultry food bill, saving time and not having to rush home to feed your chickens every day. The built in anti-flick grill stops chickens throwing food out and saving on wasted chicken feed. BUILT TO LAST: Our Feeders have a high quality galvanized Steel finish, which is built to last in the toughest outdoor conditions. RAT & BIRD PROOF: Our Feeders provide Feed on Demand for your flock, while keeping costly chicken feed away from wild birds, rats and mice. At the same time the Feeders also provide a protected way of feeding your backyard chickens on demand, allowing them to access their food when hungry, ensuring optimal laying and happy chickens. our new feeders also allow a number of chickens to eat at once. TRUSTED PRODUCT & PROVEN DESIGN: Our latest model includes side guards, meaning that chickens must stand on the treadplate to feed. Having a larger opening enables even roosters with large combs to access feed easily. LARGE FEED CAPACITY: The Automatic Feeder will hold 9kg of feed. This feeds approximately 6 chickens for 10 days as a guide. The Standard size is suitable for all chickens, pheasants and is designed for smaller flocks of up to 12 chickens. 100% WATERPROOF: Feed always stays dry. Item as advertised quick delivery. Very satisfied customer.